Most diets don’t meet the body’s need for calcium. Research has also demonstrated that calcium may reduce the risk of osteoporosis. Osteoporosis affects middle aged and older persons. A lifetime of regular exercise and a healthy diet that includes calcium builds and maintains good bone health and may reduce the risk of osteoporosis later in life. 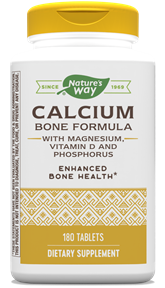 Daily intakes above 2,000 mg are not likely to provide any additional benefit to bone health. Can you tell me why the calcium products don't mention that they need to be taken with food? I've heard that food improves absorption. Calcium absorption varies based on many things, including the form of calcium as well as the presence of food in the digestive tract. While some research suggests that absorption might be a little better with food, it is not necessary to take calcium supplements with food to receive health benefits. If an individual has a sensitive stomach, we do recommend taking supplements with food to lessen the chance for stomach upset.